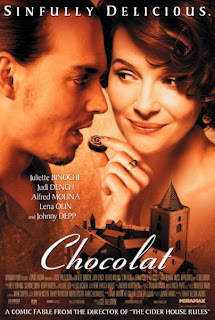 CHOCOLAT - our very first Food 'n Flix pick! How will Chocolat inspire you in the kitchen? Are you inspired by Vianne...do you want to concoct food...no, magical food to feed to those in need? Will you strive to figure out the desire of a handsome stranger? Or will you cook up a feast bound to make everybody forget themselves and focus on the magic, love, and lure of food? Will you be inspired to bring a basket of homemade goodness just to be friendly and welcoming? 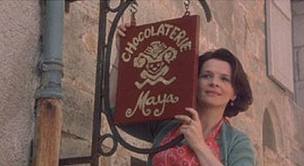 Let's get Food 'n Flix off to a delicious start and introduce our first monthly flick...Chocolat! This is a long-time favorite of mine, but I haven't taken the time to sit down and get lost in it for quite a while! So, get your hands on a copy of Chocolat and see what foodie magic it inspires in you! Post it on your blog between now and September 30th. Send me a link to your (specific) post girlichef at yahoo dot com w/ Food 'n Flix: Chocolat in the subject line (see Guidelines if you have any questions) and watch for what is sure to be a delicious roundup! Very fun--count me in! I just re-watched a bunch of these titles (it's scary how many of them I actually own) ;-) and moved Chocolat up to the top of my "watch next" pile so your choice and timing are perfect. I love this idea, so count me in, I will get my friend Alisandra to come over and do it with me! I just became a follower...but I'm not sure if that links to blog at Squirrel Head Manor, or it's my "test" blog. Either way, I look forward to joining in. What a great idea Heather! 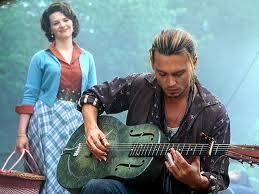 And you couldn't of picked a more appropriate or more charming movie - one of my all-time favorites. I love the idea of this - can't wait to join in. Thanks for another great idea. Nice idea! I just added the movie to my to-rent list so I can participate in September. Don't know about the next months, though, because not all movies you guys choose might be available in Germany... But still, I'll follow this blog and participate whenever I can ;o). I'll just hop in and drool over the delicious chocolate recipes you are sure to get here! Would love to participate if I could get hold of a copy of the movie. What a fantastic idea! Can't wait to join in next month.